This Americase Ultra-Lite Series case is designed for a trap single. 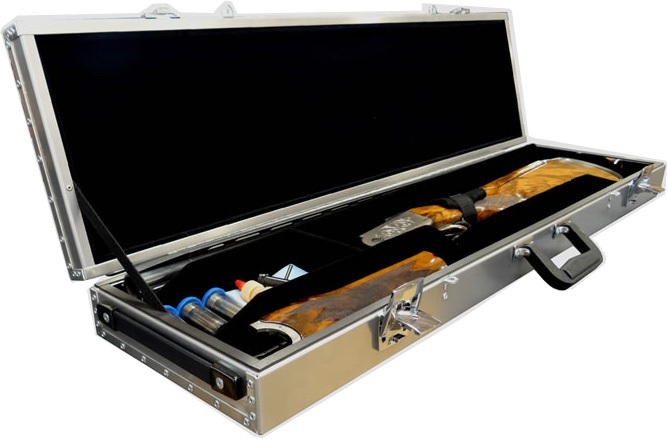 This case holds one barrel with fore-end off and will accommodate taller stocks up to 7 1/4. The stock compartment includes a grip strap to hold it safely and securely in place. The 2001 case has two areas for tools/storage. The interior is lined with Blue velvet not only for great looks, but to also protect your equipment. Additionally it comes with two high quality key-lockable latches, and two eyelets that can be padlocked and meet airport security requirements. Fore-End: 12 1/4" x 2 3/8" x 2 1/2"
LH Storage: 7 3/4" x 4 1/8" x 2 1/2"
RH Storage: 3 3/8" x 7 3/8" x 2 1/2"
Stock Size: Stock Size: 23 1/2" x 7 1/4" x 2 "